Use Gorji Gourmet Pasta Sauces In Your Recipes Calling For Tomato Sauces. Chef Gorji’s jar pasta sauces taste like you spent hours preparing them, but they only need to be heated and used in your pasta recipes. For lively vibrant taste use in place of spaghetti and marina sauce. They have no sugar added, are made with imported olive oil and are vegan and vegetarian also. Order online and have them shipped to you or pick them up at Gorji Restaurant in Dallas, Tx. This tomato pasta sauce has three simple ingredients: fresh-picked tomatoes, garlic and imported olive oil make this the perfect, vibrant-tasting gourmet pasta sauce. Wonderful on pizzas and any recipe calling for tomato sauce. In Italian lore, the intense fragrance of this sauce is a siren’s call to enjoy it whenever possible. Chef Gorji adds fresh basil, capers, chopped olives, and some cayenne pepper to his fresh-picked Pomodoro sauce to create a sauce that’s a zingy version of a classic. Arrabiata Diavolo Is For Those Who Like It Spicy! Devilishly delicious Arrabiata pasta sauce for pasta and pizza, shrimp, lobster and mussels, a snappy zing on burgers and wherever the devil makes you do it. It has a kick, but doesn’t linger. Harmony between vine-ripened tomatoes, fresh garlic, cayenne and crushed red pepper creates a clean taste that leaves you wanting more. Beside winning the highest honors in two different competitions Arrabiata Diavolo won Silver for the Best New Product the year it was introduce. 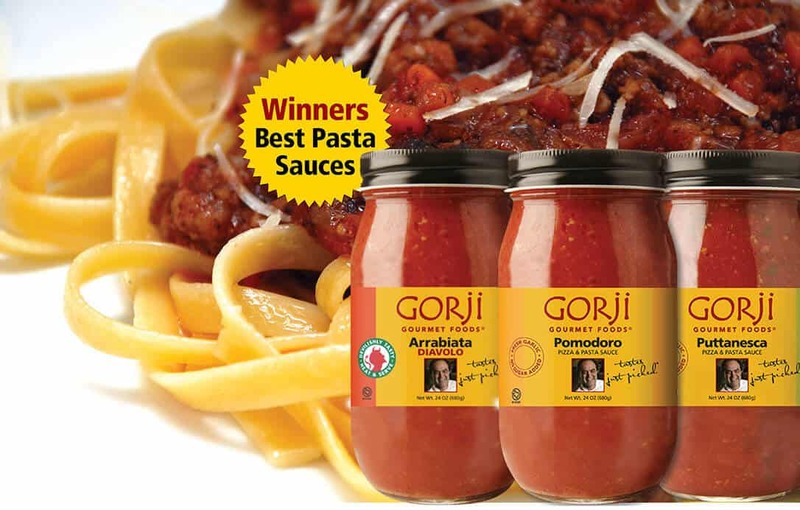 All three of the Gorji Gourmet tomato pasta sauces, Arrabiata Diavolo, Puttanesca and Pomodoro have won gold, silver and bronze awards in blind judging taste contests. Gorji Gourmet sauces combined have won 30 awards to date.